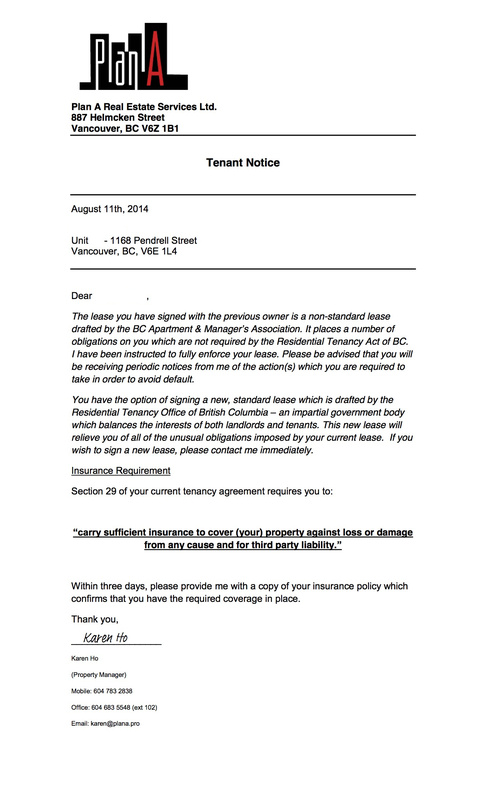 The landlord provided this tenant notice by e-mail on August 11, 2014. This notice was never posted on tenants’ doors and therefore was not served in accordance with Section 88 or Section 90 of the Residential Tenancy Act. If served properly, it would have been considered received after 3 days on August 14. Tenants would have had another 3 days to provide proof of insurance and comply with the request. On August 14, the landlord issued 1-month eviction notices to 9 tenants in 6 units (or 8 tenants, if you don’t count the husband of one tenant who was asked by the landlord to evict her husband of 4 years, because the landlord considers him an illegal occupant — and then the landlord went ahead and issued her another eviction notice for that anyway). All tenants @1168Pendrell have submitted proof of insurance to the landlord. The landlord has refused to retract his eviction notices. Aside: There is one other tenant who is visually-impaired who was issued an eviction notice, even though the tenant has tenant insurance. When the tenant phoned the landlord to discuss why the eviction notice was issued when they had already provided proof, the tenant was told to take it up with the RTB. Nothing in the legislation prevents a landlord from issuing multiple, serial eviction notices. That’s what happened @1168Pendrell where a tenant received 3 different eviction notices in an 8-day period. Once a landlord issues an eviction notice, the tenant must dispute it through the Residential Tenancy Branch or the tenant is deemed to accept the eviction and the landlord’s claims. Some might call this a legislatively-allowed bullying tactic by a landlord. What do you think? A material term is a term that the parties both agree is so important that the most trivial breach of that term gives the other party the right to end the agreement. To determine the materiality of a term during a dispute resolution hearing, the Residential Tenancy Branch will focus upon the importance of the term in the overall scheme of the tenancy agreement, as opposed to the consequences of the breach. It falls to the person relying on the term to present evidence and argument supporting the proposition that the term was a material term. The question of whether or not a term is material is determined by the facts and circumstances surrounding the creation of the tenancy agreement in question. It is possible that the same term may be material in one agreement and not material in another. Simply because the parties have put in the agreement that one or more terms are material is not decisive. During a dispute resolution proceeding, the Residential Tenancy Branch will look at the true intention of the parties in determining whether or not the clause is material. that if the problem is not fixed by the deadline, the party will end the tenancy. Can the landlord confirm this dispute did not involve Komfort Properties? If the landlord considers tenant insurance such an important and material term, why did he offer new leases with fixed-terms (4-6 months) with a non-negotiable clause that the tenants MUST VACATE (in other words, self-evict) in exchange to be relieved of “unusual terms” such as having tenant insurance? Will the landlord publicly confirm that 4 tenants @1168Pendrell signed his new lease with fixed-terms and vacate clauses, without any tenant insurance requirement? We want to hear from you: do you think the landlord and his company are operating in full accordance with the Residential Tenancy Act? Why isn’t the landlord required to prove to the RTB that he has acted in full accordance with the Act BEFORE issuing an eviction notice? Wouldn’t this step provide the check-and-balance necessary to prevent a landlord from issuing targeted, serial eviction notices? Doesn’t it make more sense for the landlord to be required to apply and obtain approval to issue an eviction notice that could later be disputed by the tenant? If a landlord has a legitimate claim, why doesn’t the landlord pay the $50 application fee that he can recover from the tenant when he is successful in his claim? While it is up to the landlord to prove his claim in arbitration, if a tenant does not file a dispute within 10 days, the tenant is out on the street. Why is the burden on the tenant to prove their innocence, otherwise by default they are forced out onto the streets? What stops landlords from going building to building, mass-evicting, renovicting, greed-evicting and bullying tenants out of their homes? This gives new meaning to evict first and hope the tenants (don’t go to the media and) ask questions later. Wouldn’t requiring landlords to apply to evict first provide RTB with its own evidence to issue administrative penalties that are so rarely administered against landlords? Why are tenants required to subject themselves to multiple, persistent attacks over a period of time before having sufficient evidence to prove a claim and request for compensation and for penalties to be levied against a landlord? How can tenants locate other tenants subjected to the same abuses by the same landlord? All publicly available dispute resolution decisions are anonymous. Landlords often have multiple numbered companies making it difficult for a tenant or the RTB to prove patterns of behaviour. When a landlord gets into trouble or receives bad reviews online, they simply register a new company and keep up with their old habits. Bottom line: landlords count on tenants not knowing or asserting their rights, and this is the quick-win for many landlords who bully their tenants out of their homes.